Usyd Quidditch was originally founded in August 2012, as the Sydney University Quidditch Society, by Liv Ronin. A rag-tag bunch of friends and last minute recruits were pulled together to form the Unspeakables, the society's first quidditch team, for QUAFL 2012. This made Australian Nationals the first tournament USyd ever played in (in the only colour of jersey not permitted - yellow- as it's the colour of the snitch), where they miraculously came 5th. (I'm not sure how many teams there were in total…) Some members of the original team such as Alex Enrico, Luke Derrick, Paul Harrison, Natalie Astalosh, and Cameron Caccamo, would stick with the club for another 4 years, becoming captains, coaches, managers, presidents, and hugely influential figures in the quidditch world generally. The society grew on campus in 2013, with some now veteran members like Kathryn Cooper and Lachlan Chisholm joining then, as well as notable members such as Alina Pahor, Cameron Brown (Captain 2015), Izzy Moore, and Rob Wells, who remained playing with the club for many years. Known as the year of the capes, because the club was gifted a large set of capes for a promotional thing, and these were indeed our cape-y-er days. It was only later in the year that the Unspeakables got more involved in playing inter-murally, and then only on occasion, thus earning a reputation as the 'Unsociables' among the community at the time, but come Nationals, the team pulled off several spectacular upsets to end up beating Western Sydney and come third - qualifying for a spot at the US Quidditch World Cup in April next year. 2014 was a transformational year for the society, under the presidency (and captaincy, and coaching) of Luke Derrick. This was the first year the Unspeakables had regular attendance at the NSW monthly triwizard tournaments. A shaky start at March Triwiz saw the Unspeakables narrowly beat Wollongong in overtime (a tournament also notable for being the last time anyone saw AJ's knees). Come Midwinter Cup, the Unspeakables formed a Merc team with Western Sydney for the tournament while rooming with UNSW at the local YHA. Thus the 'Unsociables' title was broken, though it continued for some time as a joke, and a close friendship between USyd and UNSW was born that continues to this day. While a relatively small recruitment year, it did also see the likes of Ajantha Abey, Kristie Kuhn, and Nicholas Albornoz joining, who would become big names on the competitive scene in Australia, as well as Christoph Gassner, who would go on to help found quidditch in Austria, and other long playing members like Tamara Craig and Meredith Apps. April saw the team get their first official sports jerseys (rather than just playing in red tshirts), which saw their debut in the US World Cup VII in South Carolina. This made USyd the first Australian club team to compete overseas and the only one to compete in the United States. The fledgling team was of course soundly demolished by the much more experienced US and Canadian teams, though one of the games was close, and the team still won awards for Furthest Travelling Team (lol) and Best & Fairest. The presence of the single international team in the massive 70+ team US tournament, and a highly sociable Australian one at that, sparked off our international reputation. This was also the occasion of the Werthers Crisis, the origin of "Bidditch", and the time Rob jumped off a balcony because he was the mafia for the 7th time in a row. 2014 also saw two of our top players, Luke Derrick and Cameron Brown, selected to play for the Australian Dropbears at the Quidditch Global Games in Canada, in July. Here, the Dropbears solidified themselves as a top team on the world stage, coming second in the Grand Final to the US, but more importantly for our purposes, these international playing experiences brought back a wealth of new game strategies and techniques to try, such as "Texas" (commonly called 1.5 throughout the rest of the world, though still to this day called Texas at USyd), as well as inspiring what remains the notoriously terrifying Unspeakables pre-game chant, which saw its Australian debut at May Triwiz, 2014. 2014 saw mixed results competitively, with the Unspeakables performing solidly in the middle tier along with Macquarie, ANU, and Newcastle for most of the year, with top teams of the day like UNSW and Western Sydney seemingly out of reach. Nevertheless, QUAFL 2014, held at Macquarie, saw an impressive performance by the Unspeakables, pulling off an upset win against Western Sydney, as well as a win against the eventual champions Melbourne Manticores (the last game they lost before a ~22 game winning streak that lasted almost a year), before losing out to the Blackburn Basilisks in an epic 45 minute final snitch handicap quarter final match that saw the Unspeakables place 5th. The team continued to steadily grow into 2015, so much so that it saw the emergence of a second team, although briefly, for the very first time in Australian history. The Unbreakables came into existence for April Triwiz of 2015, after which numbers could not be sustained to maintain the second team for the rest of the year. This being said, 2015 was our largest recruiting year so far, with a huge number of today's experienced members, and indeed leadership, joining around this time, including Courtney Buckley, Jv James Lim, Mirjana Stancic, Sam Chittenden, and Willem de Gouw, as well as other others who have since moved on from USyd, like Lachlan Ward, Laurel Keller, Brandon Heldt, Pelin Ersoy, Manoj Periasamy, Jason 'Shoops' Herbert, Mark Ledger, Pauline Russett, Rich Martino, Will Hendriks, and Rashad Nadhir. Socially speaking, 2015 was truly the year the club came together as a close knit group of friends, in what was undisputedly the era of mafia and card games at the Flodge after Every. Single. Training. It also saw the formation of the "USyd Quove" group, a separate facebook group to the teams group where old and new players alike could organise social gatherings and spontaneous hang outs and just post random non quidditch related content to their heart's desire, and saw the first end of year Quovemas party. Competitively, 2015 saw the Unspeakables, managed by Alex Enrico, starting to push out of the middle tier and challenge the top teams, pulling off another upset win against Western Sydney at Nationals, pushing ever closer to finally toppling UNSW, earning revenge against the Basilisks for their 2014 knock out defeat, all amounting to a spectacular third place finish at Nationals (with UNSW and Manticores again battling it out in the finals). Perhaps most importantly however, 2015 was also the year of what is probably the greatest quidditch video of all time, "the truck.mp4". So a legend was born. 2016 was another landmark year for the society. With Natalie Astalosh now president, it was a year of responsible organisation, and competitive milestones, spectacularly successful events such as Laurel's "Nerd Cruise", a much "please for the love of god read the rule book already." It was also the year of the Fronds Library Study Group sitcom. Another substantial recruitment drive finally saw the permanent implementation of the Unbreakables, the first second team in Australian quidditch history. Managed by Tegan Diep, and captained by Alina Scheja and Jason Harris, all new players at the time, the team performed impressively against many other much more experienced and established teams, thanks to players the likes of Cooper Fitzgerald, Henry Fair, Justin Miller, Mohammad Al-Rikaby, Ryan Carson, Tamara Caruana, and Zach Vidler. By quafl, the team was kitted out in brand new blue jerseys. The team was also remarkably tall. The splitting of the club into two teams was hugely important because it allowed everyone to get the game time they deserved, and especially allowed everyone to play rather than having to cut people from teams as was the case in the end of 2015. It also allowed the Unspeakables to focus on becoming more and more competitive, and push their level of play even higher, now firmly one of the top four teams in the state, under the coaching of Samantha Chittenden and Paul Harrison. The second half of the year saw the Unspeakables bolstered by the likes of Gary Hague transferring from ANU, Harry Jones and Nathan Askey-Doran, both players moving up from the Unbreakables, Ajantha returning from exchange, and the 2016 world cup winning experiences of Dropbears Luke Derrick and Natalie Astalosh - the 2016 Unspeakables captains. The competitive reputation of the Unspeakables grew after Melbourne Mudbash, where the small team came back from a 70-20 deficit against the Monash Muggles to hold out and eventually win what was the longest quidditch game since the implementation of snitch handicaps, at 73 minutes. In the wake of World Cup, Derrick & Astalosh made up one of the most formidable beater pairs in Australia, with Samantha Chittenden, who had been a Dropbears reserve, one of the top chasers in the state. In September Triwiz, the team at last scored a win against UNSW for the first time in the club's history, at which point the team had defeated every other team in Sydney and Melbourne at least once. State finals saw the 4th placed Unspeakables upset the 1st placed and undefeated Western Sydney in the semi-finals before again defeating UNSW in the finals to win the State Championships, as well as vast and frankly obnoxious piles of silverware at the state awards evening following. 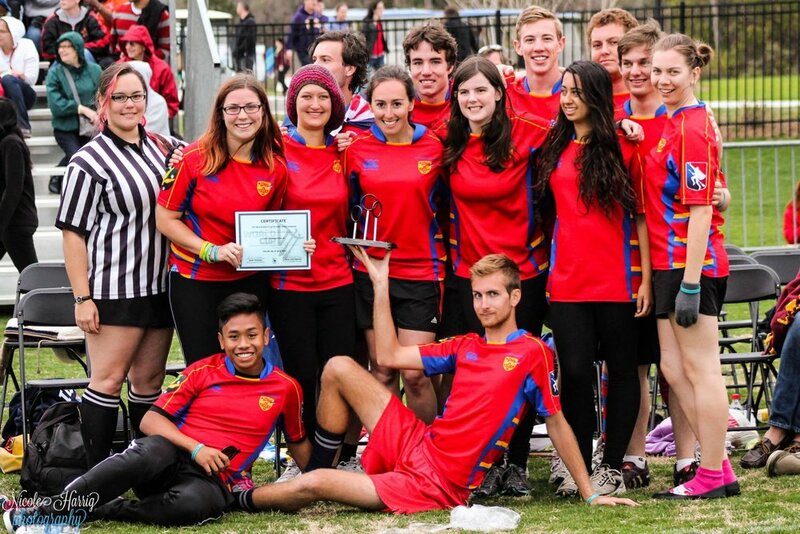 2016 was also the first year quidditch state of origin was implemented, and many USyd players represented NSW on one of the state teams against Victoria And Queensland across the year, including Luke, Nat, Rob, Ajantha, Nick, Kristie, Brandon, Laurel, Sam, and Gary, making up almost a quarter of players on the two rep teams. Having accumulated such a strong competitive reputation, there was a strong belief both inside and outside of the club that this could be the Unspeakables' year to win QUAFL, and the pressure was on, with this being the last tournament for many of the core members of the Unspeakables. Unfortunately, it was not to be, with a narrow defeat to Western Sydney that broke the curse of QUAFL upsets against our main rival team whose pool we had been drawn into for now 3 years running, that put us second in our pool, and an eventual narrow knock out to the Manticores in the quarter finals, resulting in 5th place again, continuing the pattern of coming either 3rd or 5th at nationals. The Unbreakables meanwhile went winless at nationals, although with only the narrowest of narrow losses to the Melbourne Unicorns and Adelaide Augureys, and Cooper dunking on Mayling. The shift from 2016 to 2017 was a momentous one for the society. The end of 2016 saw a huge exodus of many of our core and experienced members, as players who had been with us since our founding graduated. With over half of our dedicated playing members transferring, graduating and forming new teams, or going on exchange, leaving behind a scraggly 17 players from the 36 who had competed at QUAFL, 2017 would be the first year the club faced without its founding members, without the likes of Dropbears Luke, Nat, and many of the other state level players, and most believed that after 5 years of gradual build-up, USyd was dead. 2017 saw the beginning of Ajantha's reign as president, and an era of absurdly long posts in the teams' facebook group, excessive hashtags, relentless recruitment, endless forms, innumerable group chats, and 'please come to help get gear before training', with Ajantha also being one of the club's head Coaches alongside Courtney Buckley, while Samantha Chittenden and Lachlan Chisholm captained the Unspeakables, and Kathryn Cooper remained the club's manager. Sam in fact had her first success as captain when the team she drafted and co-captained won the Victorian Fantasy in March, a tournament also notable for a slight legging tear revealing a spec of Aj's knee. The start of the 2017 season saw the implementation of the largest recruitment campaign the society had seen to date, a recruitment campaign that has never really stopped, and resulted in not only maintaining the Unbreakables, but even growing the society to the extent that, at the first NQL preseason tournament in March, USyd turned up with three teams, with the Unforgivables coming into being as a second and equal B team to the Unbreakables, and playing in violently yellow OG USyd colour jerseys provided by Quidditch Australia. This expansion made USyd the first club in the country to field three competitive teams, and indeed one of the largest quidditch clubs internationally. The influx of new players is at this point, too many to simply list at the end of a paragraph, though the complete playing member history of the club may be found here. 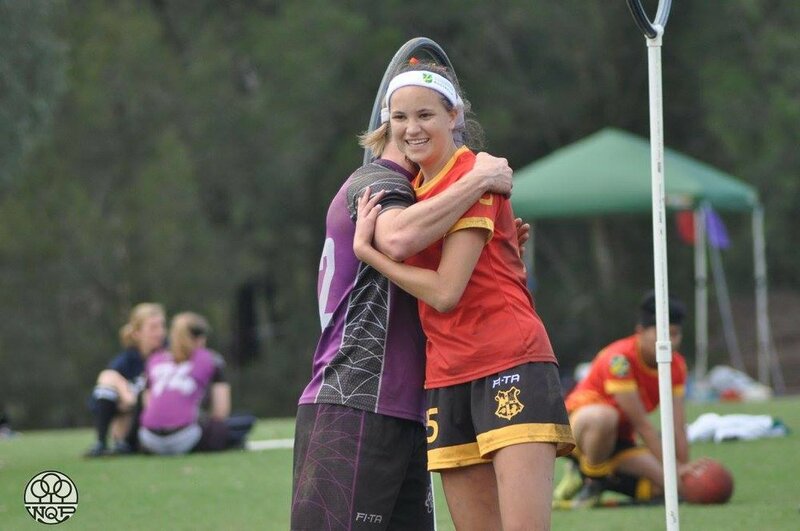 The Unspeakables of 2017 featured a majority of brand new players, though remained impressively and surprisingly competitive, defeating Western Sydney in their first game of the year, as well as Newcastle, though narrowly losing to UTS and spectacularly losing to ANU in the first tournament. (On review of the footage, we were pretty terrible back then). The Unforgivables meanwhile played their very first game against the Unbreakables, a game which was won by the original B team. Both teams being predominantly new players struggled against the more experienced teams. April saw a slight lull, with many players away or travelling, reducing us to two full teams. This was also the first time the Unspeakables came up against the Serpents. The Sydney City Serpents had formed for the first time in 2017 as a graduate community team, composed predominantly of graduated UNSW and USyd players. Founded by Alex Enrico and Luke Derrick, with Alex taking up position of Head Coach and Luke and Nat captaining the team, the Serpents featured many of our previous teammates, as well as elite players from UNSW, Newcastle, UTS, and beyond. Not only were they a formidable team, but between them, our three teams, Paul Harrison becoming one of Macquarie's captains, and Jason Harris becoming captain of the MacArthur Weasleys, half the teams in the NQL (6/12) ended up being captained by USyd or Ex-USyd players. #LongMayTheUSydQuidditchEmpireReign The Unspeakables meanwhile were of course demolished in this first run in with their old mentors, despite some fairly spectacular(ly lucky) plays, and some interesting snitch antics. The winter break saw the club sending a mixed USyd team down to Melbourne Mudbash, composed of players from all three teams, which performed impressively against the Melbourne and other Sydney Merc teams, coming in 5th, while a similar team made it to the semi finals and 4th place at Newcastle's Midwinter Cup. Meanwhile, Zach, Aj, Lachlan, and Mirjana met up in Norway for the European Games where Mirjana won silver with Team France, before the four also attended Norway's QuidCamp. Aj and Lachlan returned home shortly after, with Mirjana returning at the end of the year. No one really knows when Zach is coming home. 2017 also saw a vast number of changes around the society. For one, we were renamed from Sydney University Quidditch Society (SUQS) to the University of Sydney Quidditch Club (USQC), partially for reasons of the acronym, and partially to reflect our nature as a sporting club with multiple teams within. We began designing new jerseys, got a new logo thanks to 2017 recruit Julie Hoang, and even hosted the inaugural USyd QuidCamp and Internal Fantasy tournament across the labour day long weekend, with a full weekend of training ending in a 3 team all USyd fantasy tournament featuring players old and new coming together on the Untouchables, the Unkrushables, and the Unbananables (because why not?). August saw the start of the league proper (with May NQL being postponed), and the continual influx of new players into the club meant the Unforgivables were back in action for the remainder of the season. Captained by Willem de Gouw and Tamara Caruana, the Unforgivables developed a strong team atmosphere around hatred of their jerseys, and also became known for their notable scream circles. The Unbreakables meanwhile, captained by Alex Nielsen and Bethan Waddington, retained their win streak against the Unforgivables, though both teams struggled against the more experienced teams in the rest of the league, with the B talent split between them. The Unspeakables, were remarkably successful over the course of the season, pulling off surprising wins against Macquarie and UTS, avenging their April Triwiz loss to UNSW, easily dispatching the Weasleys and Newcastle, and pushing into range of ANU. The promotion of Alex Cunningham, Usha Luckock, and Ava McConnell, the recruitment of Haydn Johansson, the transfer of Brandon Frison, and the return of Lachlan Ward in the second half of the year solidified the Unspeakables team and brought it back up to the same competitive level that the team had been playing in 2016, finishing the league in 4th, with Western Sydney, the Serpents, and the undefeated ANU ahead of them. Ablaze in brand bright and shiny new jerseys, once again, it was a 1st vs 4th situation to reach the semis at the state finals, and once again, against an undefeated 1st place team, the Unspeakables prevailed, defeating ANU in overtime, and again later in the day in the third place play off to come third, after narrowly losing out on a finals spot to WSQC. The Unbreakables and Unforgivables meanwhile were able to win a game a-piece against each other, with the Unforivables almost defeating the Weasleys in overtime as well. At the following QNSW awards evening, the Unspeakables then again took home a huge amount of silverware, with eight players winning or runners up for various awards and the team coming away with Best and Fairest for the season. An incredibly cold and water-logged QUAFL saw the Unbreakables' first win on the national stage against the Glenelg Gargoyles, while the Unforgivables, joined by first semester exchange student and Unspeakables beater Patricia Schwann, who flew back from Switzerland just for Nationals, only narrowly lost out to the Melbourne Unicorns blue team. The Unspeakables were seeded second in their group and pulled off another upset against ANU, therefore able to top their group and move into the bracket round undefeated, only to come up against Serpents in the quarter finals. It was Old-Syd vs NewSyd [indulge my dramatism please] in one of the most spectacular games of the weekend, and after earlier crushing defeats to the Serpents, this game stayed neck and neck, with the Unspeakables even pulling ahead at the end, and a catch called no good. The Serpents nevertheless prevailed, and a catch to Old-Syd saw the Unspeakables 5th at Nationals once again, continuing the 5th or 3rd pattern. The closeness of the game nevertheless left the club more hyped than ever, maintaining the same place at QUAFL despite a vastly new team and against much greater odds. With new leadership, new exec positions, new players, new teams, new tournaments, new jerseys, new logos, a new name, and a new beginning, 2017 was the start of the next 5-year era of Usyd quidditch. Usyd enters 2018 on the foundations of a spectacular 2017, with a pool of over 50 active players, and the Unspeakables only expected to get more competitive having lost so few players and with three players even selected for the Dropbears team and reserves. The club has continued to push new boundaries in 2018, with the inauguration of the Usyd internal quidditch league, headed up by new Vice President Ava McConnell, another huge milestone for the club and another first in NSW quidditch. Undoubtedly, it will be a year of many more amazing things to come. Outside of the club itself, our members past and present, at home and abroad have also gone on to do incredible things in the quidditch world, from photography to refereeing, gameplay to media board positions, podcasts to written articles, even founding and coaching teams, playing at state and national levels, and changing the culture of the game at every level. The history of USyd Quidditch is one of repeatedly making truly magical and sometimes impossible things happen. It is one of people caring enough about making a difference, seeing an opportunity, and making it happen. It's filled with pioneering efforts, remarkable achievements, unlikely victories, seemingly unconquerable setbacks, and a relentless push to do better. It's made up of passionate, inspired, dedicated, and quirky individuals who decided to become a part of something much bigger than themselves, and devote their time to it. More than anything though, while time passes and leadership turns over and membership changes, in some ways, the culture of USyd Quidditch has always been the same. At its core, USyd Quidditch has always been about trying new things, pushing boundaries, striving to grow and improve, having fun as a big quovely family, being as inclusive and open to others as possible, and pushing members to be the very best players, people, and team members they can be. That's when the magic happens.